Watch highlights of our INSPIRING and MOTIVATIONAL interviews with men and women who have truly become Successful On Purpose. Over the years we have received tens of thousands of letters, emails and full blown stories about how TQ has quickly changed people's lives. There you will see how TQ integrates into your life, giving you the tools, technology, systems and procedures to become a Success... ON PURPOSE! You will quickly see what TQ means to so many. You will see how TQ can change your life too! Live a life that truly matters. Click image for complete details. "I am a walking testament to you both after producing Legends in Excellence™, and walking proof of how Success On Purpose rolls! Thank you E. R. Haas and Kent Madson, not only for creating a starting point, but for scientifically proving where one must PRO-actively begin to apply your provided fountain of knowledge consistently over time, in order to achieve brilliant results!" I'm living my Natural Mission... Finally! Success On Purpose is the Starting Point for a life of happiness, satisfaction and significance. Click image for complete details. Am I living my natural mission in life? Yes, I believe I am beginning to. I am an interior decorator. My best friend and I are going through the Success on Purpose book and together working through some of the "if you could.... pages and when it came to one about if you had all the money and all the time you need, what would you do.....? I answered that I would like to design chapels and worship arenas and intimate spaces. That very week I got a call asking me to do a church makeover. I am thrilled to say the least. Then when I went to the library to pick up some design books, I ran across a book on my hometown architecture and as I read through it......I wept. I actually lived in these neighborhoods, and attended a church and high school in this book! I lived around some of the most beautifully designed buildings that are pictured in the book. I was overwhelmed to realize that the time I was living in this area, God shaped my purpose. God is Awesome! He is using T.Q. to make me realize what I need to do to serve HIM more successfully. I thank God for T.Q. I recently received my first TQ book "Success on Purpose" and I'm completely floored by what I'm reading. All the research that was put into this project boils down to right where I am today. I can't believe there are other people out there in the same positions I am. I thought I was all alone in this. I have spent the last 20 years adrift on the sea of life, with no clear direction, and all the time wondering why I'm not getting anywhere. When I was younger I never dreamed my life would wind up where it is today. I have so much potential...sadly unfulfilled...and what a horrible feeling! Knowing that I am completely capable of SO MUCH MORE!!! My first goal, I'm setting today, is to completely read through and listen to the CDs so I can get my values and goals and mission down on paper in a clear and concise manner. No more drifting without a compass! At 37 years of age I have a lot of time in front of me to turn this thing around! I actually recently purchased SUCCESS ON PURPOSE, and it has lived up to even more than I expected. I now believe my Mission is at 10, and my goals are also in the 9-10 range. It's been a very long time since I was so clear on my direction, and goals. I am getting ready for my next TQ coaching session. I will put 5 of my goals, in crystal clear vision, online at TQ in the next week. This step should be considered mandatory as it is one of the keys to keeping your new life in front of you at all times. I 'thought' that I was doing the work that I was passionate about. I 'thought' that I was living my values. I 'thought' that I was doing what was best for my kids. The list goes on... 2 weeks ago my life came crashing down around me. I lost my job, I lost my company car (which was the only vehicle I had), my savings are gone from trying to stay 'afloat' and have lost my house because of an imcompetent attorney. I'm a single mom with 2 kids and have lost everything that I have worked so hard for. However, over the past 2 weeks I have realized that I wasn't living a life of my 'core' values but that I was living the values of my company and those that I thought people should be expecting me to live. And by doing this, I have lost 5 precious years with my children, my health has declined and I was miserable every waking second of the day. So, after wallowing in self-pity for a few days, out came my Success On Purpose book and I re-did the exercises. Only this time, I looked deep in my heart and left my head out of the equation. Wow! What an eye-opener that was! Then, I asked myself what it was that I was going to do now. My decision? To do what I am truly passionate about! And that is to turn my candle-making 'hobby' into a full-force business, as well as, begin training others on how to be a 'Success on Purpose'! Within, 1 day of making that decision, I had 2 accounts with stores that wanted to sell my candles (both that came to me in that one day!) along with the promise that if they like the sales they get from my candles that both stores will recommend me to other store owners they know that need a local candle company to purchase from. I'm just in the beginning steps of starting my candle business and have only just begun the steps for creating and training 'Circle of Success Dream Teams' but I know now that I am going to be living my dream and thanks to ThinkTQ will be my true 'Success on Purpose'! I feel as if my life has just begun. I have never felt so at peace with myself. My children are happy to have the 'mom back' happy and relaxed and 'here' for them again. And my blood pressure has gone from up in the stroke range (where it has been for the past year) back down to normal. Not only am I starting my new business but I am also now able to spend the time that I have wanted to continue educating myself on S.O.P. and I'm also continuing my education in both Spanish and French. I'm doing EVERYTHING that I LOVE and am PASSIONATE about! I'm 43 years old but this is the beginning of my life!!! Thank you ER, Kent and GG!! I am excited not only with my score but there are so many changes taking place in my life and I am enjoying the challenge. Thanks to Success on Purpose and all you people who stand for our success. God bless. I wept when I finally after all these years of searching KNEW without a doubt what my reason for being was. Thank you TQ for the info in this book. While I score 8 on Mission, I score less than 5 on everything else with a zero on Make Plans. Now I know that from the book such a TQ chart is not supposed to exist, so I went and did it over and my score increased to a 9.25. So am I misleading myself? How is it that my mission is burning so bright, yet I am so frustrated with where I am in life. There is so much I want to do and believe I can, so why am I stuck here? The door is right before me, but its like I can't move. I don't know what it will take to become the master of my own destiny. I tried to influence it as much as I could, but I know my dreams are getting bigger and they are scaring me. I will get to the point that nothing else will matter and I will just go do that, but I don't want to make any rash decisions. I will keep reading because I think I will get the information to improve my scores. I will plan and read and apply the lessons found in Success on Purpose, and identify and call for a team that is willing to play my song. I will communicate my dream, my vision, my direction and give my appreciation to them. I believe this goal in the context that I'll need to have more than one job at a time and will have to really scratch and claw to make it happen. This is based on my history of taking low-paying, menial jobs while in a panic to provide for my daily financial needs. Oh, yeah... and let me not forget the low self-esteem and abysmal self-confidence of adult ADHD. I want to change that self-sabotaging mentality into a realistic expectation that I have something to offer an employer that is easily worth more than $50K annually. First I have to find out what I can offer besides manual labor. To do that, I'm currently reading "Success On Purpose" to determine my MISSION in life. This is something I have often wondered about since my teens, and much more so in the 16 months since my wonderful husband died. What am I here for? Does my life matter? I'm beginning to think that it soon will! Thank you ALL at ThinkTQ.com for offering me hope in your systematic, realistic, non-poetic program! (Poetry usually is something that goes over my head, I don't understand it and basically don't like it.) And Thanks for offering the free pdf's to read on computer screen (at present, I'm too broke to buy the books, but I'll buy them for all my family and friends when I get back up and running). Keep up the good work! You guys rock!!! The big idea is simple, simple simple! Discover what's holding you back. The Power of TQ is the world's first virtual personal book on personal and professional excellence... a book created on demand just for you... only YOU. Here you will find amazing testimonials about the power of TQ in people's lives. Love, Truth, Real Power, Family, Friendship, Community, Spirituality, Honor/Character, Courage, Freedom, Health, Adventure. I have found through practicing TQ and living these values they are synergistic, one contributing to the other and vice versa. Creating a lifestyle that these values and the beauty that comes with it. Although a challenge, this list is prioritized each contributing to the next. For example, you can't have freedom without courage and no courage without character. I view the most important ones as a synergistic foundation for the others, love being the most important to me. I have learned this through practicing TQ. Thank You. This understanding has and will continue to change my life for the better, always. # 1 on TQ power is Energy. One of the components of Energy part of our life is eating right. When I eat just on the run, nothing cooked from scratch - that is kind of how I start to feel - drifting, not enough of having roots... Eating right just for a day or two - my true values start to be clear. Not eating right, not exercising, and drinking alcohol gets one to quickly forget why one is here on the Earth. The Gold system with the supportive coaching is a great way to stop drifting, and becoming who you always felt like you wanted to be. I was drifting and not sure what was important until I started using the TQ tools. I started with what I don't like or want and changed it into statements of what I do like and want. As I continue to use this sight and refine my mission and dreams, I have become very motivated and focused. I also like the daily planning tools. Don't give up. A note on the TQ QUICK START program. I just finished the 4 week tele seminar for the second time and while I learned a great deal the first time, the second time around was an even better learning experience. While the core message is the same, the delivery was different, providing new insight. For anyone who hasn't participated in this program, I would highly recommend it. For those who have, you should consider revisiting this program again. To put more fun in my life will not take much. Completing TQ to a average level of 9+ will go a long way in providing the focus to having clarity and balance. These are the things I am focusing on. TQ has helped, and I am working through the process to become focused on the direction and values of my life. Tears swelled in my eyes as I read about myself in this factor. Friday at work I realized something was missing in my performance as a leader. I have been praying about it and thinking about it all weekend. Today, thanks to TQ, I see what I am missing...Factor 10D. Thank you for your wonderful work and for helping me and so many others to become our best. 10 years ago I hadn't found the love of my life who I want to spend the rest of my life with. 10 years ago I wouldn't have believed we would have two children together. 10 years ago I wouldn't have believed I would drop out of my IT career to follow my passion for biomedicine. In the last 8 years the power of TQ has rewritten, and is continuing to rewrite my life. My TQ is 46.75 so there's room for improvement, sure, but nothing is holding me back! I have inspiring dreams. I have accomplished 2 of my goals this year, and should accomplish 5 more this year. By not hesitating, act now, it is easy when you have defined your mission and values and roles. TQ has made it so simple for us, why do we keep making it so hard on ourselves, act now, do it now! Stop letting fear hold us back! Lets not be afraid of success but rather embrace it! I've spent way too much time getting ready to get ready. That said, planning and prioritizing (know what to do and when to do) played a role too....which leads us back to passion (i.e. mission), so basically, it all goes together, hence the beauty of the TQ system! It's something I work on every day, and I often feel I'm moving along slowly because of so many setbacks. However, when I look back at where I started, I see tremendous progress. That's what makes me feel great. Looking forward to increasing my TQ! Pretty much I am happy with my direction because I am basically an optimist, most of the time. I think good things are always ahead. Have to go to work now! I started TQ months ago and was all fired up, like always. I spent a week or two screwing around making it the reason I couldn't make it to work because I was going to be fixed. Then it just fell off and I haven't opened an e-mail until now. I've done nothing towards my goals purposely and with open eyes and I'm still unhappy mottling through life. I vow to start today, I wish I could get past e-mails and start over but I'm starting from right here, right now and everyday. I refuse to live a life that doesn't support my dreams and admirations, and I refuse to give up and live with less. I'm sorry I let myself down, but here I come... It hit me yesterday that I don't know what I'm doing and I'd better learn now. I've lost way to much. What would it take to start living my best life, right now? I'll tell you what's doing it...not taking anything, any factor, any advice of my TQ system lightly and following and implimenting the program daily. One of the astounding things I've found with the various printed and audio material is how CONDENSED with POWER and ENCOURAGEMENT each paragraph or statement is. I'm an avid reader of the biggies, Vincent Peale, Og Mandino, Zig Ziglar, Tony Robbins, etc...etc.... And it's mandatory to have a pen or highlighter handy to mark "the really good stuff". Well the way Haas and TQ have condensed all these same authors (and many more) makes for some marked up pages and rewound and rewound and rewound listening. It is like necessary food, man, for successful thinking. Time to stand up to myself, all by myself and for myself and all the others who need me. Saying YES to my small goals and setting a time in my diary. Amazingly, this simple act set off a chain reaction and turned my TQ around. What's holding me back from living my best life now? Wow, I think that I have just been letting certain circumstances hold me back, but I can see now that I can still go forward anyway. I can take the steps that I can around the circumstances until they change. My perspective is indeed changing. Thanks T.Q. I am not living it yet! However, I am determined to take a step daily toward accomplishing each of my goals. Thank you for the encouraging words. I also know that I must dedicate some time each day to read my TQ. Most people see me as someone who has been successful in all areas of life. When I look in the mirror, I see someone who has been given a tremendous amount of opportunities and been only mediocre at making the most of those opportunities. I have started the exercise of creating a personal mission, vision, and goals at least a half dozen times. I let fear and useless activities get in the way of executing my goals. I am looking forward to using the TQ process to go from where I am to absolutely great performance and achieving my dreams. The timing for the performance improvements I expect to achieve from TQ is perfect. Success would not be handed to me. I would have to WORK at it. I must say that on a daily basis, I get a cherished PUSH with the e-mail I get from ThinkTQ.com. To all the Team at ThinkTQ, keep up the good Job. I am like a roller coaster, I know what goals I want to achieve, I know I am capable of achieving these 3 goals, I am gaining on it! But I am not pushing or exceeding my expectations. Its almost like I am scared or afraid to reach these great results! I am going to overcome this fear that is blocking me from a truly successful and happy life! I Thank TQ for being there to pick me up and get the wheel rolling again to that place we should all be, that feeling we should all feel, that we all deserve! I will reach my goals of substantial increase in income, quality time with my family, and be in total control of my freedom, by Dec 2010. I will be able to do things that have real meaning and importance in my life, to make me happy and my family happy! This is an absolute! Not sure how many opportunities I've missed. But procrastination has DEFINITELY kept me from being as productive as I could have been. One of the many great bytes of wisdom from TQ that has stuck with me in THAT regard is to take immediate action on what needs to be done, regardless of inward resistence. If it's the right thing to do and it's the right time to do it, for the right reason....it must be done....regardless of inward resistence to doing it. When I have "tangible" opportunities, I think I have always been good at going for it. However, in my area of interest (writing and speaking) opportunities are not always so easy to define. Since networking (attending events, getting in front of audiences) would clearly open more doors for me, I would say I have let amazing opportunities pass me by. It's my intention to work with TQ to create a plan, so that will help break down the bigger vision, so that I go out and find opportunities instead of waiting for them to knock on my door. I've been taking these last few days to remember what it is I really want for not only me, but my family. When your a stay at home mom you lose site of what you really want in life. You just let life live you. Thanks to Maikel, my coach, and TQ I've found site of my dream's and desires again and more driven now then I ever have been. TQ is helping to improve my Time Quotient! I spend most of my time in action, however, when it comes to goals I think "Excuses" rings true. There really ARE valid excuses for not doing what I want to do (like working to pay the mortgage and taking care of kids) yet I know if I were more committed I could carve out chunks of time to perform bite-sized tasks as I can squeeze them in. This is the area I need help with and one of the main reasons I became involved with TQ. I'm probably more on track to becoming old and cynical at this point, but I'm going to turn that around. I had shelved my TQ materials for several years, but I'm going back to working them. I recently read my personal book, and I'm not working on Values-Vision-Roles. I'm going to turn negatives into positives. I love the insight and self exploration that I have gained while going through the lessons. As a perfectionist, I need to know that I am working the right way toward a goal. Through TQ, I have learned that I have been treading a lot of water, all my life, in the pursuit of happiness. I love the concept of breaking down goals into small doable tasks so progress is seen along the way. At 56 years old I've gotten a late start on planning what I want to accomplish in my life. I wish I would have had this program in my youth. My life would be so different if I had started this decades ago. TQ didn't exist then, but now that it does, it would be a very good program to be presented in high schools, so future generations will start off their adult lives on the right track, with goals and the life plans to make them a reality. You have a tarsier inside you! You have to relax, smile and don't worry and imagine it is easy! TQ is the map, Kent is the car and Haas is the boat! Do what it takes to find it! Remember imagining it is EASY! Currently I am going through a large life transition. Honestly there are times when I am sad, when I grieve my loss, but most of the time I am looking forward, seeing that I have a whole field of possibilities blooming in front of me. Now instead of spending hours and hours just watching the beauty of this sea of colorful opportunities, I am now carefully selecting the blossoms that matter most to me and creating a bouquet that reflects my most important hopes and dreams. Taking action. Moving forward. Increasing my personal power with each step I take. Each decision I make. Every goal that I set. But most importantly - every day I am smiling. A good, positive attitude has always been a strength of mine. It has only gotten better since discovering TQ! I've learned to harness the power of attitude to strengthen my other colors, and have taken my life and career to the next level! I expect the next 5 years to be even better, thanks to the Power of TQ. Wait until I get to unstoppable! My attitude right now is a solid eight and enough for me to succeed, coming from TQ=16 three months ago to TQ=59. I now have my fifteen year vision and I am breaking it into steps. I have the win/win multiplier embedded in the vision so my contribution generates many flow on effects. I had hoped to start purchasing a few products a long time ago but having been so crippled by my attitude for MANY YEARS prior to getting acquainted with TQ, I never got to that point. This had caused me to feel ashamed that I had received so much from TQ, yet, had not returned my gratitude in any tangile way to date. However, I thank God, that will change very soon. Because of their generous giving of themselves, last month for the very first time in my life, after many years due to my stagnated mindset, I eventually emerged out of the catacomb of my negativity; (in spite of the fact that I am very ill at this time). I became positively charged and focused to actively market my products. I sold my first piece of creativity, as well as, created a positive feedback and response from quite a number of people, which in turn increased my motivation to suceed. That's what I like about TQ. Their one desire is for all of us to optimize our potential so that we can achieve our highest best. They have chosen to give of their time, and expertise to the benefit of all, at a considerable high cost. It's a sacrificial cost to assist those of us who are unable to purchase their product immediately. They are fully aware that for many of us, our financial status has been sabotaged by our attitude. So they decided to train us at their expense, "TO TEACH US TO FISH." Then hopefully we'll have the decency to return our gratitude when we become overcomers and begin to move in the direction of success. This program must be costing them a great deal to maintain it, especially in these difficult times. Nevertheless, they continue to be the silver-lining behind the dark cloud for us, ever challenging our potential to succeed. I trust that we will all take their time sensitive instruction seriously and act upon what they have invested in us. Their efforts should not be trifled with or wasted. May we, one by one, cause them to share in the joy of our victories, that they may rejoice that their efforts paid off well after all. Thanks TQ, words of thanks are just not enough, for the transformation you have brought to thousands, perhaps millions of lives across the globe. Thanks for the inspiration to keep it rolling today. This is easily one of the most powerful days of TQ. My wife and I, with a couple of very close friends, have shared a dream for several years. It wasn't until we made a plan that everything changed. Now we have made MAJOR accomplishments over the past few months, and are within a few more months of reaching our dream. This could never have happened by simply wishing, or even wishing and working. A plan was absolutely vital. I would soar through in an airplane viewing the horizons and terrain an as transcended from various countries throughout the earth's hemisphere. Meeting and greeting people from throughout the world serving God's will. Each and every minute of my life, managing time complying with God, Law of Life, Living with Purpose, Committing to Outstanding Results and Higher Expectations. Knowing that I'm the Architect that plans life achievements through changing habits of Living the Think TQ principles for life. Energy, Mission, Attitude, Set Goals, Make Plans, Priorities, Organize, Optimize and Act Now will help to focus on becoming servants to God and Mankind through Outstanding Performance. Life can sometimes be like fighting the waves to get out to the open ocean - and when I look back on the good and bad times of the past decade, I thank God that at the end of the day I still hang on and trust things will work out for the better. As an entrepreneur with a passion for helping others, I failed miserably at a couple of ventures because of two main reasons. 1) My lack of accountability - and subsequent sliding into unhealthy stress coping behaviors. 2) My inability to be assertive and communicate effectively as a people pleaser. I got into some serious debt, and was dealing with some emotional issues from the past. But I was committed to moving forward. Today, I am writing this from the kitchen of my home. It is a rainy day, but I just enjoyed the morning with my beautiful wife, my 3 year old daughter, and my 1 year old son. I have gone from the agonizing failure of my projects - to having to work on the oil rigs to catch up, to getting married, to ending up with a job that I one day dreamed about, but never imagined existed. I am earning over 6 figures now, and have been blessed richly. I know it is a responsibility to take the things we have and learn to give back, but it is so important to learn to take care of yourself as a priority in order to do that. I am 49 years old. I have come to realize that middle age and financial crisis does not go well together, it presents a real dilemma and can even become tragic. TQ transmits a light of hope to help anyone who will receive its concrete time tested messages regardless of their age. I must admit that at times I am a bit petrified by the standard they ask us to strive for (especially due to the fact that their newsletters are sent to the general populous without an age limit on any particular topic). I guess they are basically saying they place no caps on age, as we continue to exist we can still achieve our highest goals. I have been reading TQ for a few years while battling many obstacles. I am not whining but these are the facts: domestic violence including sexual abuse of my daughters, a divorce, being a single mom without any resources such as education and child support, educating my 4 children, getting a BA and MA for myself, having a grown child become severely disabled, helping my family heal, having multiple health problems of my own, permanent, severe leg injuries from an accident, and being on a black list at work for the final 10 years there. I was very naive about a difficult situation there, so it was my own fault. Looking back I say WOW to myself, but it was not a fun trip. I am now retired on a very modest income but I CONSIDER MYSELF FINANCIALLY FREE because I don't have to go to work in a place I hated,(I have a skill in pitching pennies even if I don't earn big bucks) so that is another goal I have met. This is all to say that my ATTITUDE has been my biggest obstacle to financial and personal success. My sister reminded me that growing up in an extreme fundamentalist home we were taught never to want or expect anything good. ( a favorite hymn in our church had a line in it "such a worm as I"). Life was pain, suffering, and self-denial. That is what I got. That realization has caused me to focus on my ATTITUDE from here on out. The messages from my past are so deeply ingrained in me that positive thinking and affirmation seemed so false and phony. One thing I learned is that I can rephrase my thoughts into intentions that are believable. I listen to audio messages that are inspiring, read positive and healing books, listen to positive gospel music, and a church that is changing my perception of God to a loving, creator. My attitude is changing and as a result I have become more outgoing and friendlier to other people. I am happy and smile most of the time. People respond positively to me, now. My health has improved dramatically. I have lost almost 100 pounds and can walk uphill for a mile or more - unthinkable 2 years ago. I have several new goals for my retirement years, including earning what I deserve through creative endeavors, and am more confident that I can achieve them. Reading TQ has helped tremendously. Things are finally beginning to stick in my head. Attitudes, expectations, and personal power have taken on new meaning for me. Goal setting has never been my problem. I have been my problem, getting in my own way time after time by being fearful, negative, and a severe introvert, almost reclusive. Over the past couple of days I have read the comments posted here and find them enlightening and motivating. I believe this is an excellent example of SYNERGY as this forum is more than just words written and posted in cyberspace. I look forward to seeing how everyone else progresses with your goals, dreams, and visions. Setting goals had no life or meaning for me until I slowly started to read and to answer insightful questions from TQ. I am planning to walk the Camino in July 2011. My walks have become meaningful as I train to train. I am developing a walking program and have some good ideas about funding this. Yes, this goal is in alignment with my goals about my physical, mental and emotional health. While I aim for the stars, I will lose weight, and feel healthier because I'm eating better & exercising. YEAH! I'm getting over the shock of seeing how little of my potential I'm manifesting. Just beginning this process, digesting my own TQ scores. The fulcrum of the colors is my lack of clarity on Mission. I know how to use many other skills, but don't do so because I'm not really committed. Defining a mission which is inspiring for my whole life but able to be applied concretely to "each precious minute of my only life" is something I find scarey. I need the clarity and the courage to define that mission. Since what I am and have now is exactly what I have been committed to up to this point, and that is not what I want...so, it follows that I must carefully review the TQ scores and commit...REALLY commit to using my time and energy and skills more wisely. I'll need a daily schedule that I'll actually use and keep that adds up to a week and a month of completed goals. It has been two weeks since I started with the TQ program and the truth is today is the first day I actually took the time to answer the questions provided instead of just reading on. I will go back to each days lesson and complete them slowly and carefully with thought. Thank you TQ, my life is changing already; I took action. My single most important goal for 2007 is to increase my TQ score to above 80 - that is achievable over the twelve months and will provide the power to achieve all other goals. As you say, I am challenged daily, doggedly Fear, Intimidation and Doubt can Overpower me, but I can use Courage, and Trust to Succeed. It is good to know there are others who are committed to making 2007 their best year yet. I know that I am determined to change my life from the way I've left it in the past; focusing on the problem instead of seeking a solution. Thank you TQ; I have found you at just the right time; before I gave up hope of ever changing. Think TQ is the greatest gift to humanity in this day and age. I am going thru an unexpected personal crisis. CRITICAL and UNGRATEFUL RUINED MY RELATIONSHIP. This revelation made me realize who THE REAL ENEMIES are. THE NEGATIVES in my PERFORMANCE. If it were not for the TQ DOCTRINE I WOULD BE SITTING IN THE SHALLOWS OF DESPAIR FEELING ETERNALLY DOOMED TO INEVITABLE & UNAVOIDABLE PERSONAL FAILURE. THANK-YOU E.R. HAAS AND KENT MADSON for GIVING ME MY LIFE BACK. (tears) CRITICAL & UNGRATEFUL. The negatives in my performance. You asked what a TQ at the time 37.5 (now 45.5) means to me - I related it to all aspects of my life. (Career, Parenting, Financial, Relationships)That amount of skills factors is directly relevant to all areas (THE ROLES) in my life. That amount of skill factors is not enough to be satisfactory in any roles in life. At 24, Single Mom with two children not financially independent as yet.... I FEEL VICTORY in the face of ALL ODDS. I wrote this because I don't know who else is in the same situation or who is going thru what. The thing is to be Grateful and like Napolean Hill said "For Every heart ache or failure there is an equivalent or greater benefit" FOCUS ON THE TREASURE. Isn't that what you said? IN EVERY UNHAPPY STATE OF PERSONAL FAILURE IN LIFE (IN ANY ROLE) - THE NEGATIVES ARE THE REAL ENEMIES. LEARN, GROW - BUCK UP. This is my first journal. What a breather. FOCUS ON ALL THE TREASURE I EXCAVATED FROM PERSONAL CALAMITY AND WALK AWAY FROM THE CHAOS WITH OPULENCE. GOD BLESS E.R. HAAS & KENT MADSON (& TQ CORPORATION).... AMBASSADORS OF HOPE. In 2009, applying the principles of ThinkTQ, I had my best financial year ever. I hit all of my numbers and exceeded my own expectations. I lost track of 2 goals, my weight goal and my savings goal because I did not apply the TQ principles. So in 2010 I will stick to the program because it works! My pledge in 2011 is to make & save. Thru TQ I have learned to understand the importance of values, and that your quality of life is so important to happiness, being able to do what you want, when you want, by living thru your values and mission! God EXPECTS us to use that gift to accomplish His mission to mankind. Because of ADD (Awareness Deficit Disorder) as TQ calls it, we tend to ignore the Magnitude of that gift. Mankind can be truly a Living Miracle if we recognize these awesome talents that we have. When God asked King Solomon of the Bible what He wanted, He asked for wisdom. I have asked God for Wisdom myself for the past 4 years. This is my number 1 Value that I picked. Wisdom is a miracle from God. And if we asked for it, God will truly give it. It is just so amazing how we can be a living Miracle if we apply all the amazing tools TQ has to offer. We do not have to really Wing life as I have done in the past. You can be a living miracle using the TQ system. Again, I give ER Kent and Maikel the credit for my success so far. I have total energy, with all of the chatters that are going on in my life. I will use Think TQ the entire year to move forward with my dreams and aspirations. I will totally revamp past bad habits and embrace new good habits to achieve my objectives. I will no longer depend on others to make my dreams come true. It is no longer acceptable for me to live a mediocre existence. I have found someone to stay on me to achieve my dreams. I have not found anyone to help. I am always the one to help and encourage others. When I need it I am getting it for myself. Right now TQ is the one to help me and the power that is within myself. I am always touching my dream, however, if someone asked me for help I seem to put their needs in front of my dreams. I enjoy the feeling of helping and kick myself because I have no time to work on my dreams. I will make time to work on them every day. I will continue to read my TQ, because TQ helps me to stay focused and committed. With 18 days left in this year, I have no time to waste. How do I feel about my accomplishments? That is an excellent question, with today being my birthday and all. Overall, I feel pretty good about the things I have accomplished in 2007. I know that I did not do my best this year in a lot of areas, but in some areas I have made significant progress. In 9 months, I have lost a total of 39 pounds and 25.5 inches all over with my workout routine and eating regimen! That is my biggest accomplishment this year! I also have started a brand new business and am working hard to build my organization. I have done really well on the job, and am starting to take on new responsibilities. I have improved my friendships with some really important people in my world. I have a long way to go, but I believe that with the help of TQ and much prayer, I will get there!! Now that I look back on it, I realize that I have accomplished much by way of my family, which was my focus and my health. I also see some improvements in my work ethic and subsequent results. All in all, 2010 has been a growth year and I am very excited. I am blessed to have found TQ, I should say it found me. Intrigued by the TQ test, I dove in. The results were a huge revelation. Thank you for the compass to get me out of the wilderness of mediocrity. E.R. I have been a T.Q. member since 2005 and in the past year really started working hard on my TQ. I cannot believe the rush of emotions I am feeling and the positive results from the new direction implemented. I have a long way to go, but the switch is finally in the on position and I will update as progress is made. I began the TQ program some months ago. I followed the material, nevertheless any time when I came up to the point to write my Dreams, to follow with my Missions, and Visions, I became stuck. Like being at the edge of a precipice, unable to write a word coming from my inner self. I realized that I had to heal before my truly felt needs, and dreams would come up. I decided to go for therapy. I am letting my night dreams come out. I am beginning to re-discover my biggest gifts, so stimulating my deepest dreams, and desires; I am pretty sure that at this stage my 10 Colors of Intentional Excellence will be brighter. The TQ methodology will be guiding me, gently to write down my most deep dreams, missions, vision, and fulfilling goals. I am finding what was holding me back in my inner-self, preventing me from being able to bring my dreams out, and everything that I had done courageously, had helped me, as the TQ System, therapy, readings, family and friends support. My conclusion is that whenever there is a deep loss, fear, anger, or any negative feeling in the soul, healing will bring the serenity, clarity, and strength to overcome those stagnant feelings that diminish the courage we need to envision our Life. The central thesis of TQ is Continuous Personal Improvement through Continuous Personal Inspiration. Ultimately, it is all about YOU... you achieving your dreams and goals... you living your best life ever... you becoming all you are meant to be. The key is for YOU to unleash your full potential... every single day. Even if you think you know something, the reminder is important to reinforce the concept. As it has been pointed out in the commentaries, just because you know what to do, doesn't mean that you do it. Or that you do it well, or do it for the right reasons and at the right time. All that takes more than shooting from the hip! I created my business over 30 years ago and have done pretty well. As somewhat of a pioneer in my industry I had to figure a lot of stuff out as I went along. You name it, I think I've been through it. I've always had somewhat of a natural TQish way about myself that helped a lot. To all you wonderful, brave folks just starting your businesses I say Bravo!! Go for it! There will be plenty of ups and downs and highs and lows. Fortunately, you will have this program to help keep you moving forward, to help smooth out all those highs and lows and to help keep your eye on the prize. Fortunately, you will experience freedom in this very un-free world. It is time - today is a new day - we CAN achieve excellence in ALL that we do! I definitely need this lesson. I tend to choose mediocrity (good enough) over excellence because to me, that is the easier thing to do. I am trying to grow my business, and I must pursue EXCELLENCE with everything I have inside. I cannot allow other negative opinions (or even the opinions I have of myself) to stop me from sharing myself with others or from building relationships with companies that need my services. I'm beginning to feel like Lady Luck! My performance in my real estate work improved greatly. I came to understand that I work more powerfully leading a team model rather than being a lone wolf. Acting as a loner does not provide me with a sense of satisfaction.....I was not able to deeply understand that until faithfully reading and digesting TQ. Motivation, Mission and Set Goals--I have trouble with "Someday, I will" because memories of past failures (fear), unnecessary hard work (intimidation) and weakness (doubt) immediately surface. "It is OK to trick yourself into action" My trick is to take away the strings and free the imagination. So I use "I desire to...", "I want to...", "Someday, I see myself...", "Someday, I want to be...", "Someday, I want to give..", "Someday, I could..". After selecting the best of these visions I can commit and use "Someday I will...". Asserting myself upon my self with Courage and Trust. When you are focused on your dreams, desires, missions, goals and plans; your life will prosper. It is then very important that you teach this to your kids and family. As I feel the weight of the day's negatives accumulating I say "EXPECT MORE, EXECUTE BETTER" and instantly I feel more positive. Then I say ENERGY, PASSION, ENTHUSIASM and I have aroused my personal power to take more action. Where do I want to be in 5 years! This is my first comment since becoming a TQ member years ago. In 2012, I have greatly worked on increasing my energy level - mental & physical. I journal what I eat, my exercise/activity, and my mental state. I am very pleased with the new results and have 3 times more energy than in the past. That is a good question. Because I had no confidence, no drive to move ahead, no dreams to fulfill, too lazy to be pro-active. But now I have the goals, the missions and plans in place. I should conquer all the above problems and be 'the successful person." Today, TQ has been a blessing to me and caused me to move forward and do the things that I had been bogged down in. My business has just been sitting there, but now it's moving full steam ahead. I'm making contacts, I'm getting training on how to improve my business and make it more liquid. Really looking forward to Dec 31, 2011. Man's overwhelming ability to keep himself from what he or she wants, stands up as one of the greatest challenges we face. Success to me, has always been the courage to go through the locked door rather than wait for the key. This year my plans are turning into reality, even though my critics are still saying no. Life is not a spectator sport, with GOD as your coach you just can't lose. It is amazing how this can change the outlook of the whole day. As of the start of this year, my first task each day is to take the 10 minutes it takes to review my daily TQ lessons. This keeps me keyed in on the necessary actions I need to do, allowing Intentional Excellence become a part of my life. I am a new man three weeks into this and it is unbelievable to the outsider, but believable to ME and my wife testifies to that too! I am 53 and for twenty years I have been looking in all the wrong places. Until I looked within and stopped making B.S. excuses for acting like a looser. I never believed in ME. I am the answer to my own problem. You are the answer to your own set of problems. One of my favorite quotes was "God don't make no junk" It was good for others, but I never believed it about me. Excellent! Thank you and keep up the great work!! You're helping me more than you know. These little journals are helping me to focus on a daily basis. I had felt like I was growing old and cynical until two things happened in my life; my new career in financial services and TQ. Both are making me revaluate myself internally. For the first time in my life I can taste what success feels like. Before, I unconsciously believed in fate. Today, I recognize the importance of using the free will God has given me to prayerfully exercise it with care and planning. Two days ago I visited a client in dire financial straits. I sat and listened to all the excuses they had after I showed them what could be done. I felt compassion for them because that was me not too long ago; I had multiple excuses for why I wasn't acquiring my dreams in life. I still have them, but they are diminishing and by the end of 2008 the word "excuse" won't be in my lexicon. TQ daily in the morning gets my mind right and my motor running! Daily step by step actions, completing my daily, weekly, monthly, yearly goals, plans, to do list, master list! Small increments of action on a daily basis, towards the completion of my goals is how success is born and achieved! This time next year, I plan to be a successful writer. I have strong faith in my ability to succeed at my chosen career. I will continue to write every day, to paint irresistible pictures with words, to bring influential people to read my words and to buy my products. When I have reached that goal I will concentrate on the next one, etc., etc., for the rest of my life. Over the last 4 weeks I have been working very hard, I have no time on hand. I was complaining until last evening, because I wanted it to be an easier, simpler life. But I realized while speaking to a buddy, that I can actually be in gratitude for all that I am achieving, rather than just rant about what is not done or incomplete. Here's to a new decade of planning, action, growth, and change! :-) I'm ready!! My regret for the past ten years is that I have not put enough action behind my dreams and goals to help make them a reality. While prayer, positive thinking, having a great attitude, and hoping for change are steps in the right direction, they do not make it happen. Not having written plans to give me direction towards achieving my goals has kept me spinning around in the same spot - - feeling busy, but not accomplishing much. My priorities have gotten mixed up. Feeling overwhelmed has led to procrastination and immobilization. Feeling guilty because I 'should' be able to do this has only caused me to be even harder on myself. It has been a vicious cycle and it is time to break it! It simplifies the whole thing gradually. God bless the entire team. Through experiences, you cannot do everything at the same time. I realize life happens with many many demands from all of your life roles. We must determine what is important NOW, and also not forget to make time for what is important to the accomplishment of your goals. I started out with four goals and decided to table two of those. I will get back to those, but only after I have completed the two that have a higher priority. I have specific, written goals that are aligned with my values. I have a master chart of my top goals taped to the wall right in front of me. My master goal chart has dates, priorities and plans. It keeps me on track every day. Several months ago I listed my top ten values. It was a great exercise into my soul and life and I discovered I really live my life by my values. However, I have been struggling financially for many years and I have come to a very insightful conclusion. My conservative, religious upbringing did not consider my values as means to financial security. My top values include cherishing my family, intellectual growth, creativity, flexibility in my work day, spiritual growth, and learning of other cultures. I realized I believed living these values and the actions I take regarding these values are not deserving of financial rewards! That's a false belief! For example, I can channel my creativity, intellectual pursuits --my entrepreneurial strengths -- into financial rewards. I am now self-employed and the review of my mission and my values keeps me motivated! As the old saying goes "The squeeky door gets the oil." With the daily tsunami of junk that can hit one everyday, your notes help keep me on track. Thank you again. I am loving my #1 squeeky door being the pursuit of my goals, plans, and actions. The statement is still a work in progress however, I made a choice to work on one thing that day and I chose to make it my financial goal - to take control of my finances. I was immediately thrown into a situation that I should have been able to predict but didn't. Yesterday, my priority was to organize myself at work. The same thing happened, not as dramatic as the day before, but I succeeded in working and aiming for excellence at my task. Today, I will concentrate on more organizing in my home. Planning on purpose, using my mission statement as a guide for a wide open door to success. This article is amazing. It is so true in allotting time for every day to make the whole weeks objective easier and simpler. It is exactly what I needed to read, but then again every TQ daily e-mail is exactly what I need to hear at that time. I am now active in my life. I am setting goals and going to do one at a time until they are completed. I would like to see me #1 my health improved drastically by physical therapy and my mental and emotional health grown also, #2 once my health is improved on to a job...then once in a job look for what I want to do or create it for myself. #3 money...take responsibility for my own debt and finances. and move ON...... #4 by Dec.31, 2009 I want to be on my own paying my own bills and creating my own destiny to greater heights. 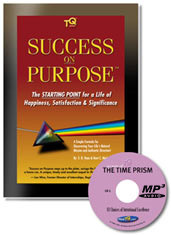 Today, I ordered Success on Purpose Book and CDs. I recently joined another support system and so far it seems to be lacking the clarifications your system offers. Thanks for sending me the Daily TQ's. Everyday in my e-mail box they have been chipping away at my resistance to real changes. Even when I didn't open the e-mails, I saved it, every one of them and each day it reminded me that the tool was there if I wanted it. So finally, now I am here and now I want it. Thanks for all you do! I usually shove my worries away after I have the beginnings of a plan for them (just a beginning). There is one, however that always pesters me; am I a misfit of society because I go in my own direction 100% of the time? I have gone my own way because my Path is too important to me. Now that I have found my path, life has become much more meaningful and fulfilling! Every conversation I have invariably leads people to it. Environmental Health and Wellness (within and without) is a concept I want all to understood and what I want on the lips of everyone. It does worry me somewhat that I have zealot-like qualities though :). Not all that much, but some. May you be immortalized forever in the hearts and minds of many! I determined to make changes this year and have started VERY slowly. I backslide a little bit every day, yet keep up with some of the changes I have made. If I do just one of the new things each day, I consider that day a success and give my self a star in my planner. Setting goals and strategically making moves to achieve your desired end is a constant process. You as a person have to be accountable everyday to do something toward the goal or goals you have chosen for your life. Measurable goals are common in learning new things. To learn something you have to study the subject and to achieve goals one has to study making sure you are approaching the goal correctly. Goals are consequently learning something new because yesterday you did not know if you could achieve the goal you accomplished today. It takes alot of small measurable goals to make a large goal a success. For every lesson one learns, one knows the next time achieving our perception and success of the goals happen when our beliefs in self are fully realized. Be clear about what my goals are and write down an action plan. Each day I should be accountable for something checked off that moves me in the direction of my goal. The more checks, the faster I will attain it. I hear you, but ask yourself if your measuring to your own definition of success. If the definition of success is the next promotion or the bigger pay raise or recognition then you need to learn to be more political. If your values have words like integrity, or principles, then look for a new employer that has the same values. If your in an environment where "rewards" are based, not on results, but on politics then you have 2 choices. Set a mission to show those above you the difference or change jobs where results are the primary measure. I guess, it's #1 mission - change those above you. I will begin the PRIORITIZE workshop. This action will boost my MISSION, SET GOALS and MAKE PLANS colors. I need to look at MISSION to assign priorities based on values, look at SET GOALS and MAKE PLANS to have tasks to choose. And in posting this I am practicing ACT NOW. Yes. I produced Great Results in the last 3 Years and its worth the Bargain. Within the last 42 days my tangible results have been great. I'm now moving towards greatness. I'm in grad school, and searching for an internship. I had a dream, I set a goal, I made plans, and then I took action on them. Now that I consider it though, I believe my goals were not as well defined as they should have been and so looking back, I am not able to measure my success against goals. That being said, though, I will therefore fine tune my weekly goals so that this time next week I can honestly compare how I have done. By the end of February 2013 I have grown my online business to the point where it covers all of my bills; in addition, I have gained enough muscle mass that people who know me look twice and wonder how I did it. I have also increased my energy level to a 10; most people think it's a 12 but what do they know? They're only 4's and 5's! Wonderful as usual. I have one comment on the statement "I am confident that I can succeed at whatever I do, as long as I simply take the right actions." I suggest that one will succeed simply by taking "action." The use of the word "right" implies there is a "wrong." It is stated in the written and audio that as long as you continue to take action you will discover the "right" action. My comment is there is only action. You will succeed by continuing to take action. I am making a promise to myself, ... to thine own self be true. I haven't even begun to tap into my potential. If I stick with my action plan all things are possible. I should believe because this belief pulls me forward to success! I have the skills, determination and now the road map to succeed. Without believing in success my other alternative would to believe in failure, mediocracy or just getting by. I choose to believe to succeed, knowing I have the skills or will learn them!! This week I am pumped. Something shifted in my thinking and I realized I have been limiting myself and it is TIME to take the shackles and blinders off. Looking back over the last 2-3 years of my life, the power to execute has impacted me the most. Taking the right action at the right time is critical in making decisions. I expect a promising outcome by summer. I will have achieved my goal by fully committing and reviewing my goals twice a day to help me keep motivated. As I see the changes occuring before me it keeps me pumped. I believe I will succeed because I have the will power to take action and to follow through until I reach my desired goal. I will not allow anything to distract my focus to complete the project. I have been given the skills to act, and to lead those around me to follow my lead, and to get the job accomplished. Yes, absolutely with the help of ThinkTQ I will improve my goals and plans. My other factors will help me not only meet, but exceed my expectations in 2009. If you BELIEVE it, you can take action to achieve it! If you believe you will or if you believe you won't....you are right. Why not believe in success? I should believe that I will succeed because it helps my self-esteem. Believing in one's self is part of what gives us the courage to keep trying. Believing in myself is basic to moving forward and reaching goals. Failure to believe that I will eventually succeed creates discouragement and low self-esteem. It prevents us from trying to succeed and causes us to want to quit. I know I have the energy, drive, intelligence and sheer determination to make anything I desire into a reality. Everything I have sought so far I have went after and have succeeded, though at times, I did set my goals to low. Now I am re-entering the income making part of my life and need to discover which way to proceed as I really want to be passionate about what I do, not only for me, but as an example to my kids. Anytime my TQ for the day delays popping up on my screen I feel as if something important is about to be cut off from my whole system of operation. When a person has a clear goal and a PASSION for that goal, he/she WILL succeed. I have been reading TQ for several weeks now and have realized that I have never been passionate about anything. It is clearly depressing. It leaves me in a place of mediocracy and I don't like it. This year-2011-is the year that Change Happens. I am committed, I have a clearer vision, and I have direction. I will succeed in achieving my goals. My number one personal goal for 2013 is earning an income of $100,000 this year. I believe it is achievable, it's highly desirable and highly believable. I'm ramping up my making plans color and optimizing my energy to get it done. I am very excited. Lack of time is an excuse not a reason because we all have 24 hours in a day. What we prioritize gets done what we don't doesn't. So report, review, and revise if and when needed. My plan is to learn how to plan, and plan it! I realize how important it is to plan with my mission and my goals written out clearly, so the first thing is to clearly write out my mission. I must admit it is not clear yet, but I plan to spend time at the same time everyday to write it down. Write down goals and keep a journal. To become a Leader of Excellence, and grow my unit size to 100. My Production each month will come with the greatest of ease and I will achieve my Goal of production at $18,000 per month. It will happen. At first, the amount of information was overwhelming. Slowly, it is coming together; especially after the TQ Basics tele seminar. Now it is hard work. This week, instead of taking off highly motivated into a brand new year (2008) I'm feeling somewhat burned out. That happens from time to time and I've learned to accept it. You see, years ago, if I felt tired, unmotivated, or had a lack of focus, I just thought it was my lot in life. (Or rather, I didn't give it any thought.) That is what I would have done differently. I would have been more focused and concentrated more on identifying and achieving goals. However, I didn't know how to do that. Do you want to hear my excuses? No, I think not. I don't want to hear them anymore. Today, I'm feeling burned out, and yes, I'm accepting it because I need a day of rest. But I'm not giving in to it--just allowing some rest. TQ is helping me to take control of my life in a way I've always wanted. I've always wanted to be a steady, reliable, organized person that is highly efficient. Now I know the reasons I wasn't. Success is already at hand, just knowing this. I could have boosted my TQ colors more to get even greater results.. The information and exercises offered through the TQ system are wonderful. If you focus on them and follow them, you could accomplish so much. I used to react - "Oh, no! Why does everything bad have to happen to me!" "Nothing ever goes right!" That sort of nonsense is spoken from a Victim's point of view - and from poor planning. Nothing just "happens" - It's the stage you set for yourself, and I've learned that. My stage is 62 years old and just beginning to find my place - hell_ I have been everywhere - done everything - and plan to do more in the future - BUT - I am living life just one minute //moment at a time NOW - that is good enough for me at this moment - I hope this makes sense to all of you - It makes sense to me - I count my blessings each day ( TQ helps ) thanks a lot everybody - Thanks a lot - - best to all - love you all - WOW - that is a big deal for me to say - I love you - do it everyday with my friends and family - everyday = all day long - I love you - Best to all again. I am involved in the challenge now......I created a goal for the first half of this first month of the year and I met it! I feel like a different person. It feels like my old adage.......Lead, Follow or Get out of my way!!!! Today is the beginning of the rest of the month.....I'm going to do a stretch goal for this time period. I will increase my commitment to my goals by writing them down and reading them daily or more (critical for me) until they are ingrained in my mind. I also commit to carrying out my plans daily and getting rid of something that is draining me, so far for January I am on target and it feels great. I will reach out to my wife, family, friends and mentors or coaches to share my goals and mission. I want to set up our family mission as well. I will live this year based on good nutrition, excercise and God. I also joined the TQ Gold program this month to help me achieve my goals for this year and the years to come. I spent most of 2006 "getting ready to get ready." Now it is time to launch my new scrapbooking business. No excuses! No more procrastinating! It's time to become the success I know I can be. I don't make new year's resolutions... I create do-able goals. 2006 was the year for gathering together the materials needed, and networking to get my name known in the "right" places. 2007 is the year to bring it all together to make it happen. I am very proud of myself, and I thank TQ very much for the push I get every day. Every single day I am making real progress toward my goals for 2007. When I think of what I am going to do next and hesitate because I have not done that particular thing before....I hear TQ say...BEGIN IT!!! You are just what I needed at this time in my life. Because of the help and encouragement you give me, I know 2007 is going to be much better than it would have been otherwise. I pledge to put into action (I have begun) the teachings and recommendations of TQ on a daily basis and to achieve my goals for 2010. I am thankful to be alive and well. Thankful for my family and friends. Thankful for Gods Guidance to help me see his will and do the best I can everyday. I will create SMART goals. I will be more productive and more efficient. I will remain grounded in my priorities. I will believe, and visualize, my dreams. I will maintain focus, drive, and determination. I will incorporate resolve and resolution. I will take time to show gratitude for my blessings. Thanks folks......you are doing a great service to our world! I am thankful for Christmas.......the Christ Child and a reason and a purpose to live. I am thankful for my husband....he has cancer. I am thankful for my sister-in-law who had a heart attack...died for 10 minutes and was revived with no lasting damage! Praise God! I'm thankful my oldest son came through serious back surgery....plates, pins, screws and a bone graft......All since September......It's been a tough year! It took me a year to go through Success on Purpose....I learned the value of people, time, energy...life in general. I thank the Savior Jesus for TQ and it's principles....actually...they are HIS principles. TQ helped me apply them and stay focused. Even though I am laid off temporarily from work, having the tools from Think TQ, I am making the most of this time to dream greater dreams. I am thankful for the imagination that is being reignited in my life today. Today, I am living in my own mobile home that affords me the quiet -- one of my greatest values -- enjoying the quiet to immerse myself in reading and building my business as a virtual assistant. I'm in that sweet spot. I'm going to take action, work daily with TQ so I can stay on track, and believe that things are going to be better for me and my family. Thinking more about my Mission and Goals, Formulating and acting upon my Plans. I pledge to live my MISSION everyday, ensure that I have energy and conviction to achieve my goals by maintaining a detailed SMART goals and revising daily, weekly and monthly progress in 2013. I am going to take ownership of the choices I make, acknowledge the positive outcomes and address my mistakes. I am going to make my life more manageable by learning to do less each day but to do it well. I will stop rescuing others and using this as an excuse for not acheiving my own dreams. I am going to learn to do what I love, and love what I do. This goal is very achievable. I believe with the proper planning and execution, my 2013 will get off with one of my best starts. 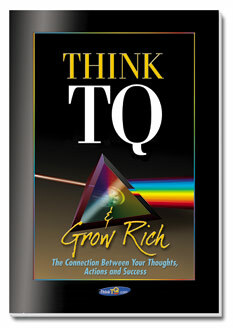 By committing to reading Think TQ daily and incorporating at least 3 of the daily challenges or questions into my life. I can indeed begin to see a turnaround in my low performance and execution. I have committed to purchasing the TQ Gold this year. This will be the main system that I use to bring about massive change in my life. Like the old saying goes, " There is nothing to fear but fear itself." I believe everyone does at some point in their lives have fear, but the key is not letting failure enter your mind as a reality. If you know in your mind that failure is not an option, then it will not ever be a fear of anything less than success. Success must be the only option allowed in your life. What you believe in your core values is the driving point to all your success, or failure. If you do not believe in failure then there is no way you should ever fear it. I will use the mantra of "It Is Possible" today to turn around my negative thinking. Years of negativity have ravaged my brain so I rarely think positively. It is time I changed for sure. I feel I have wasted my life! Double time when it comes to full spectrum success. I admit TV was one of my time wasters. We all have the same 24 hours to waste or invest. Develop and grow. I have two wonderful girlfriends who serve as accountability partners to me and I to them. We meet in person weekly (one is in Atlanta so we call) and check in with each other every day to see how each of us is doing on our goals. I have to say that having someone checking on me daily and having to "report" my progress each week keeps me on my toes! I just started subscribing to the Daily Lessons in Excellence and I absolutely love them. You guys really know your stuff! This is some of the most professional, insightful, visually appealing and (most importantly) useful information on personal and professional development that I have ever come across. I especially like the "goal ideas" at the beginning of the message. I really appreciate your posts each morning. Working at home alone, the few moments with you each morning are better than any rah-rah office meetings endured through the years! I have been reading everyday this year but not making obvious progress. I couldn't see those dreams clearly enough. This week I realized that I need to show gratitude by trusting life, myself, and others. Be grateful for the endless opportunities by taking more risk. So I have told my wife (giant step) that I will take early retirement to follow my fuzzy dreams. I trust I will be told exactly what to do, who to contact, what my dreams are, just show patience and believe. I am excited about life again. Already by trusting my intuition, I have met a coach to help me. With each and every day, I realize that I am the only being who is responsible and committed to myself. In order for me to accomplish all of my dreams, I need to first decide what my dreams are and focus on solely achieving success. I use to have that drive, but I don't know where it went...but I will get it back ASAP. 10-15 years from now, the only consistency that I am guaranteed is myself. I make thanks giving part of every day. It took me a long time to come to this practice. It was not easy. It took me looking at myself and realizing I was my own barrier between the good and the postive people and things in my life. Like most everyone else, I am struggling to stay alive but I am so eternally greatful for every little victory - simple things like just being able to pay my bills and mortgage - that I will always remember this time in my life as a time of learning and growth. I give thanks everyday for my friends and loved ones. They are the my reason for being. I give thanks for my friend telling me about this program. I give thanks for my life. Yes, I realize that my success is based on the part I play - actually in my case I am the only one who has a part to play in my success. However, I am not really following through on my action plan - I keep writing lists and never doing anything on the list. Just rearranging the lists. All of my many projects require much more will power to be started let alone successfully completed. I really need to learn how to start before I can finish anything. Hopefully this program will help me do that. I know that I have to do it myself. So today, I will plan out my week - starting one project today and working on it thru Wednesday. Thursday and Friday will be dedicated to other ongoing projects. Then back to the first project again on Monday thru Wednesday. I think I am getting closer to being up to the challenge. I've set my first mission to start on February 1 and have outlined most of the steps to accomplish it. After this weekend's Quick Start session I am taking whatever time it requires for the balance of the weekend to complete my mission plan. I will have the rest of the month to make sure everything is in place by Feb 1. It will be my first litmus test to how much power I can generate when I focus on something that has been in my mind for a long time. I am finally setting specific goals and the means to achieve them. I was expecting a large inheritance and found out that "Step-Mom" had a good time just prior to my fathers death. It is now up to me. I can do it with the help of TQ and my goals. I increase commitment by visualizing having my goals completed every day. I deeply visualize. Then I spend time seeing myself overcoming all the obstacles that were in my way to achieve all of my goals. I am really proud to come through my worst depression and see the positive outcomes of that experience. Now I can really relate to others in that situation. After more searching I found meaningful roles that match my talents. Now I am back in the TQ Program and counting my everyday human roles of dressing myself in clean clothes, paying bills on time, keeping the car serviced, putting out the garbage, walking the dogs, being polite, etc, etc .........So much excellence can be unappreciated and Appreciation leads to Gratitude. This time my wife and I will create a wish list with a time frame to achieve and comments about what could stop us from getting them. Doing only the important things to achieve my goals, roles, values and to make my vision a reality. I am very excited about this test, spent extra time with the book. I have to work very hard to stop all of the procrastinating in my life. I seem to make excuses for not doing something. I will not give up on my goals. Much luck to you all. One day at a time. As I am learning and getting more proficient in the TQ system, I see my conviction getting greater. Once my values are aligned properly with the goal, set the plan, act urgently, I see my life changing for the better on a day to day basis! I have also noticed, by writing in this journal, that I think it, say it, then write it! Then success is inevitable because it becomes a part of me! I find this so valuable! Understanding and dealing with the complexities of life can sometimes be overwhelming; TQ's Daily Nuggets of Inspiration and Wisdom help to keep things in perspective. Working with the TQ elements helps, as well as, prayer and Reiki, good vitamins and enough sleep. I can now also give more when I don't have to be in control of the entire process and create a specific outcome. Way too often... the problem is that when I set limits on a conscious level I keep telling myself I can do anything but on a subconscious level there are doubts. I think the trick is to eliminate the doubts by taking action and fine tuning the results until they become exactly what was envisioned. Taking small action towards a big goal, setting daily to dos that work on the bigger picture. Start by doing it today and not some time in the future. Setting goals is one of the most fun parts of personal development. I need to work toward achieving them every day, and to be more organized. I do not have big goals anymore - they used to be bold and big - now they are small and manageable, small and attainable. We feel our products are simply the best ever created to evaluate and improve your performance. You are 100% correct. What was good enough to get me by last year doesn't have a snow-balls chance this year. I have to do things differently -- just to keep pace. The Power of TQ truly opened my eyes to my current limitations and my ultimate potential. I am ever so grateful. "The Power of TQ changed my mind and changed my life..."
I rarely read self-help materials. I don't normally write endorsements. But your idea of creating a book just for me had a lot of appeal. I'm glad I got it, as it's changed my life. "I learned More in 20 Minutes Than I Could On My Own in 20 Years..."
I am Senior Sales Manager for a Fortune 500 company. The pressure is intense. The demands are enormous. 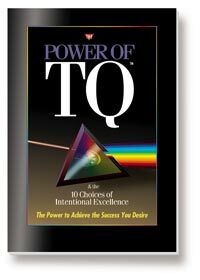 I learned more about super-star performance by reading The Power of TQ, than taking a hundred seminars. I can't wait to take my test again next year and see if I did increase my TQ by 20 points. If I do, look for me on the cover of Forbes or Business Week! How right you are. Training, without repetition and reminders, is in fact useless. It lacks the punch to change habits and lacks the structure for success. Today's TQ works! Thank You. "Time Is More Critical Than Ever. You Guys Deliver..."
Without doubt, this is the absolute best experience of my adult life. I work in a profession where time is not only of the essence, it's everything! You've given me a tool that I will use for the rest of my life. "The First Simplified and Unified Approach to Success..."
You should call this Success 101 or Success 1-2-3. It's simple and it's brilliant: 1 - Determine what you want. 2 - Find out what's holding you back. 3 - Eliminate it! I got the message and I'm one happy customer! "Too bad every college doesn't use this to evaluate your success potential BEFORE you leave..."
"Simple, Simple, Simple! BUT, it changed my life..."
This simple straight in approach has changed the way I look at life. As you say, life is a blur of actions, reactions, urgencies and emergencies. By breaking down who I am, what I do and how I do things, I now have the power to live a life of results, not regrets! "Fantastic Ideas = Fantastic Results..."
This stuff is fabulous! The idea is so simple: remind me, reward me and results me! I love it! Your tqMail is so consistently helpful, I would never even consider missing a day. In the last 3 months, my boss noticed a big change in my attitude and my organization. He gave me the raise I had been asking for... for over 2 years. I guess I'm now worth it! "No other word but THRILLED can describe the impact this has made on my life..."
I was poking around the web one night when I found your site. WOW!!! Little did I realize there was someone out there who had a handle on the issues I am facing right now. I took your test, ordered your book and was not only pleased... I was thrilled! You delivered exactly what I needed, when I needed it and in a way I could make use of it. "I Finally Saw Time and Results In a Whole New Light..."
That formula for success (TQ=R/T) is wonderfully simple. I hate math... but even I could do it in my head. More Results, my TQ goes up. Same Results but at the expense of more Time, my TQ drops. It's great! Thanks for a program that makes sense. "This gave me a personal edge..."
I'm always looking for something new to give me an edge. You are TOTALLY RIGHT. It has become a survival of the smartest economy. I highly recommend this to anyone who has to become smarter today than she was yesterday. "The Power of TQ is WONDERFUL..."
It's worked wonders in my life. Fast easy read. Its power is timeless. And I really liked the way you linked everything together and color coded it for instant access -- from my dreams and visions to my actions. Simple but highly effective. It's wonderful! "I was floundering and had no IDEA why..."
My boss came in a week ago and told me that I needed to work a lot harder or I was out of here. But I was already working as hard as I could... or so I thought. Now I know that working harder isn't more time and effort, it is working smarter. I not only turned my career around, it changed my entire life. Even my friends noticed the difference too.